Terrifying stories of people being attacked by snakes often surface on the internet with disturbing videos showing human beings found inside massive serpents. But there are also rare incidents when snakes are seen attacking and even regurgitating other snakes in blood curdling videos. 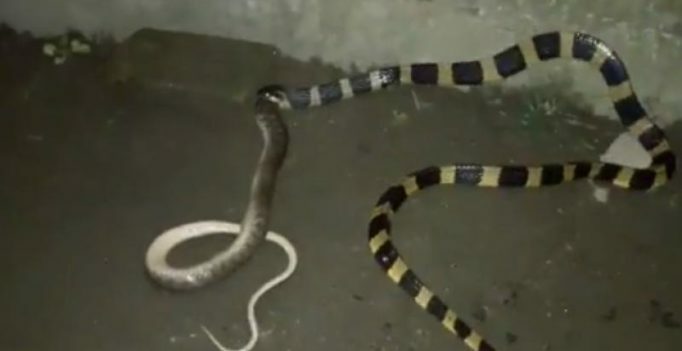 A similar shocking video is doing the rounds on the internet and here a snake identified as the black and yellow branded krait can be seen swallowing another snake. The footage was filmed by animal workers as the serpent made its way down the checkered keelback’s body. The branded krait can grow up to 2.1 metre in length and are among several species of snakes which can swallow things bigger in size than them.